Just a quick post to remind you we are mid-way through Challenge 113 at the House Mouse and Friends Monday Challenge, which this time the theme is Make Wishes Come True. So come on, ink up those House Mouse, Gruffie or Happy Hopper stamps and join us for this fun challenge. Get some inspiration from the House Mouse challenge Blog. Sue, your card is darling! The colors you've used are fabulous and the image is just precious. Lovely!! Awww just adorable. Your paper chhoice actually makes your image jump off the paper. Have a great day. Hi Sue who wouldnt love this oh so cute Hopper image? gorgeous colour combo great layout super HM creation. what a lovely and sweet card sue. Adorable! I must get to this challenge! Eek! Sue, such a sweet and lovely card. Hi Sue! So lovely and adorable your baby card is. Such a cute image and lovely colours. Sweet baby card!!!! I haven't seen that HM image!! Too cute! Would be perfect for my neighbor who's due in a month!! So cute! I love the pretty colors. Great job! OMG do I love that image! 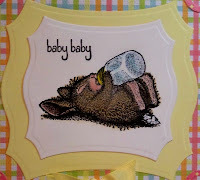 What a fabulous baby card you have made! Very sweet card Sue...the pretty details really make this card shine. Enjoyed the music tonight! LOVELY DP and gorgeous coloring. What a sweet take and so precious.